In the movie “Forrest Gump,” there is a scene where Forrest is sitting on a bench at the bus stop, talking to a stranger. Forrest says: “Momma always said: ‘Life was like a box of chocolates. You never know what you are going to get!” Well, I don’t know about life being like a box of chocolates, but I do know that life is often like riding a bicycle; the only way to stay upright is to keep moving forward, maintain your balance, and watch for bumps in the road! Several years ago, I read a book by Anthony Robbins called “Awaken the Giant Within.” In that book, Robbins describes what he calls the CANI principle. C-A-N-I is an acronym for Constant and Never-ending Improvement. The principle states that in order to live a satisfying life, we must constantly strive to grow and to improve. I whole-hardheartedly agree! The ongoing process of progress and constant improvement are essential to a fulfilling life! Anything that is not growing is dying! And just like riding a bike; if you don’t keep moving forward, you are going to fall down! In addition to the need to be constantly moving forward, there is also the need to constantly maintain balance. In riding a bike, you must constantly shift your weight from side to side to maintain the proper balance needed to stay upright. It is also necessary to maintain a proper balance in life. Too much of this and/or too little of that can cause us to lose our balance in life. And if we lose our balance in life we will fall down! Another principle in riding a bike that is applicable to life is to always be aware of the bumps and irregularities in the road! In order to do that while riding a bike, you must not only look in front of you to see where you are headed, but you must also periodically look down to assess the conditions of the surface you are riding on. You do this to adjust to and to compensate for the bumps, dips, or holes in road. To successfully navigate through life, we must also have such a dual focus; looking in front and looking around at the conditions on and around the path upon which we are traveling. No! I am not so sure about life being like a box of chocolates, but I do know that life is like riding a bike: If you don’t keep moving forward, you are going to fall down! If you don’t maintain your balance, you are going to fall down! If you don’t take into consideration the conditions of the path you are riding on, an irregularity will cause you to fall down! 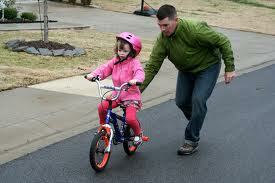 But if you have fallen off your bike, take courage, get up, brush yourself off and try it again! The best is yet to come! Your best performance is ahead of you! If you find your life dull and boring, it might be because your bike has stopped moving! Start peddling! Start moving forward! There is one more thing we can learn about life from riding a bike: Once you learn how to ride you never forget! So if you haven’t been on your bike in a while; if you’ve suffered some setbacks in life and you feel like you can’t get back into it; remember, if you did it once, you can do it again! Life is like riding a bike; once you learn, you never forget! Just get back up and get back on! You may be a bit rusty and wobble a bit at first, but if you keep at it, you’ll be riding like a champ again! This entry was posted in Inspirational Thoughts, Teachings and tagged balance, consistancy, Cycling, effort, progress, success. Bookmark the permalink. 57,253 others have been my guests. Thank you for your visit!